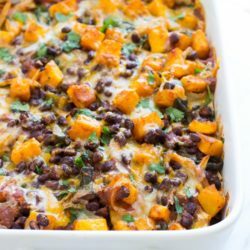 Butternut Squash Enchilada Casserole- roasted butternut squash layered with tortillas, peppers, black beans and enchilada sauce. 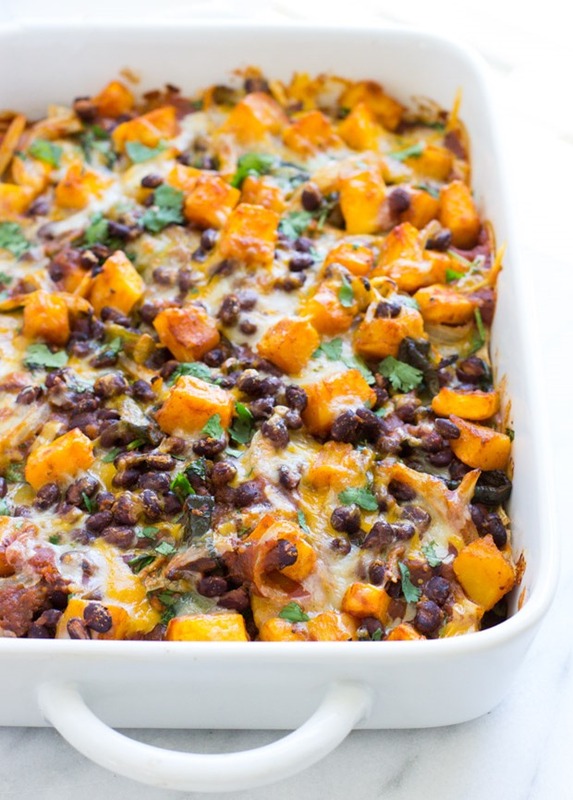 Makes for an irresistible casserole that’s sure to please a crowd! How are you guys holding up so far this week? I know this time of year can be challenging, with the dark mornings and shorter days. I feel ya. I had to get the flu shot for work last Friday and it’s had me all of out of sorts ever since. My head is achy, my thoughts are foggy and I feel drained of energy. I think my immune system is still trying to figure out what the heck happened. In the meantime I’m doing my best to feed it lots of healthy seasonal veggies like kale and butternut squash. 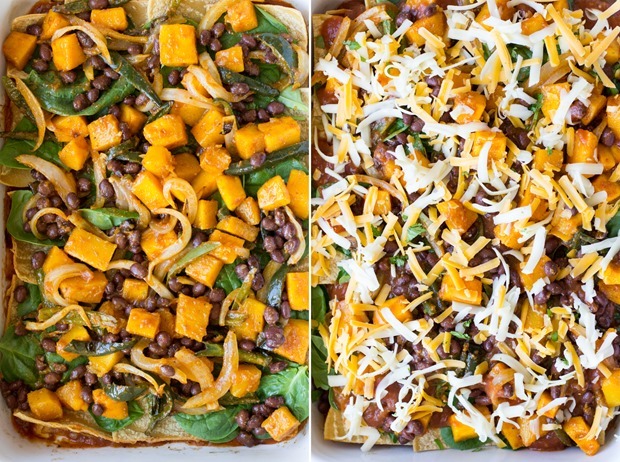 Sorry if that misled you, this recipe doesn’t include kale. Although it could, if you wanted it to. I just had it in a smoothie today which is why I said that. 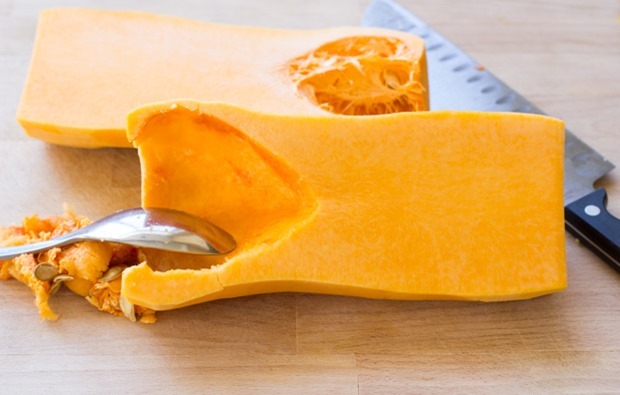 But it does include butternut squash! This is actually a recipe that I posted back in the day and have continued to make because I love it so much. The pictures from the original aren’t quite up to snuff so I wanted to update it with new ones that will hopefully do it the justice it deserves. 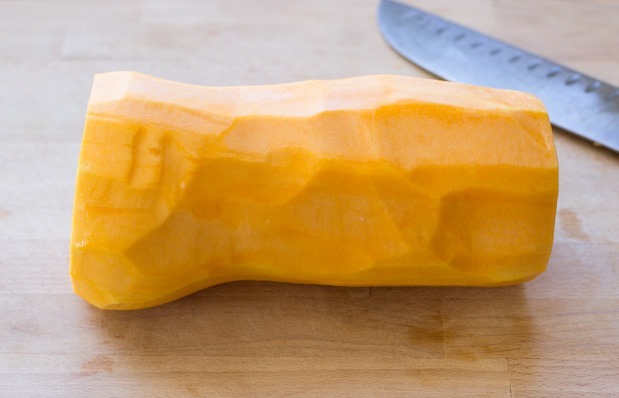 In case you’re new to cooking with the delicious butternut squash, I also included a tutorial on how to prepare it for roasting. You start by peeling the skin all the way around and then you slice a little off the top and a little off the bottom. 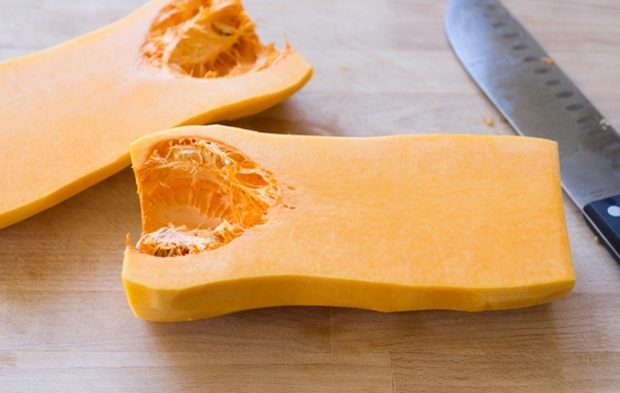 After that you cut it lengthwise down the middle and use a spoon to scoop out the seeds and flesh until it’s so fresh and so clean, clean. Then you slice it lengthwise again but this time in small 1-inch sections. 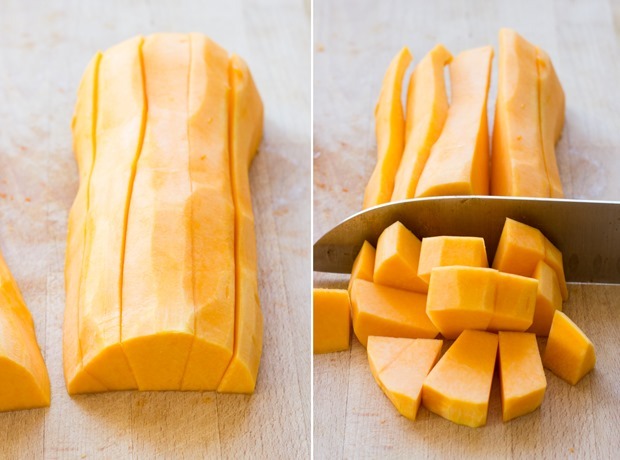 Once that’s done, turn the knife perpendicular to those cuts and then slice it into 1-inch sections so that you have cute little butternut pieces. After that beast has been tackled, you toss it in a baking dish with the pepper and onion, lightly coat them with high heat oil and roast in the oven for about 45 minutes. 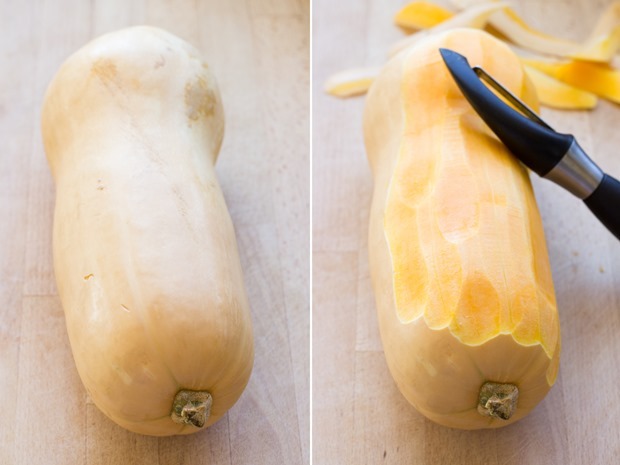 Side note: if that whole cutting squash thing seems like too much, you can always buy it already cut. No one is judging you. Okay so after we have our veggies roasted, we set them aside in a bowl and use the same baking dish to prepare the casserole. 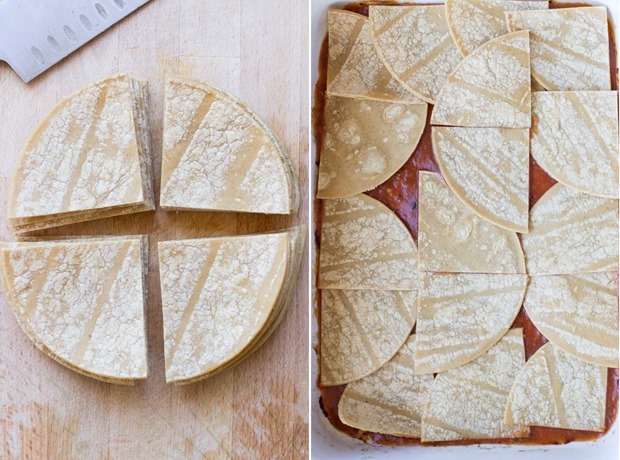 Start by layering a light layer of enchilada sauce (or salsa) and top that with the tortillas. Next add the roasted veggies with a layer of cheese, then repeat that same step again and that’s it. It’s ready to bake! 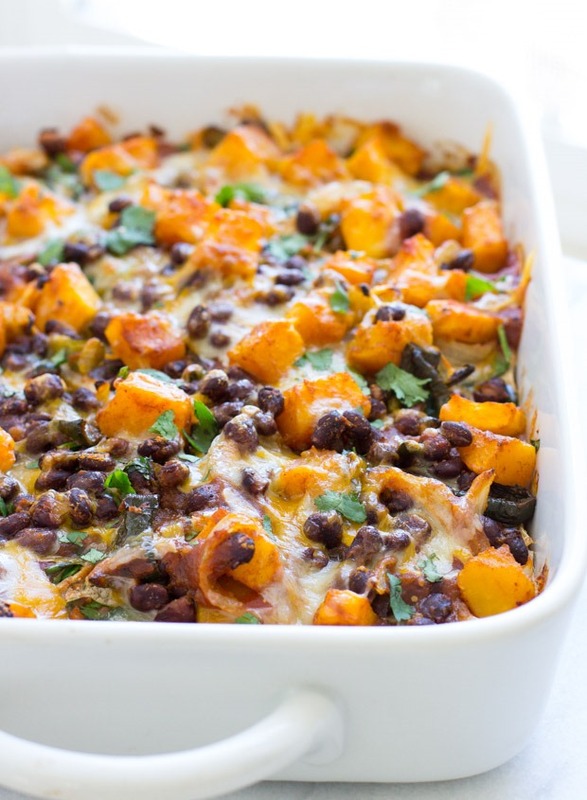 This casserole is just as comforting as it looks. 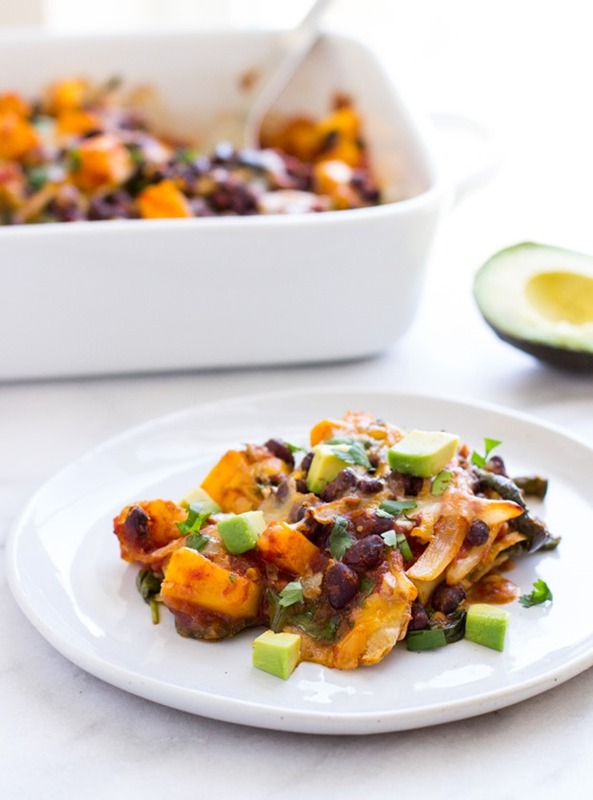 And it can easily be made vegan or gluten-free by omitting the cheese (or substituting dairy-free shredded cheese) and using corn tortillas. We like to top it with diced avocado and a little fresh cilantro then serve it with a small side of chips and salsa. I emphasize the word small because if you’re like me then you cannot be trusted with a full bag of tortilla chips and salsa. It’s just too dangerous. 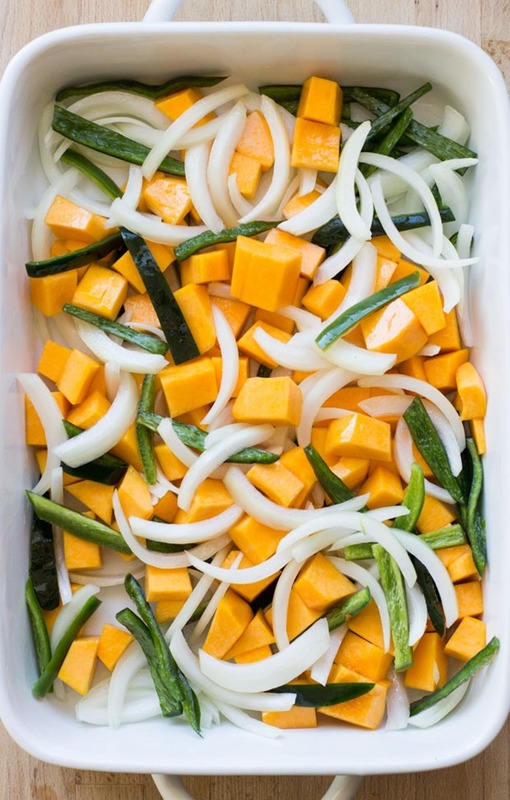 Allow it to cool for at least five to ten minutes then cut into squares and serve. Garnish with avocado, cilantro or plain yogurt. *You can lightly toast the tortillas by placing them directly on the rack in the oven and broiling for 3-5 minutes on each side. This step is optional but it helps them keep their shape after baking in the casserole. 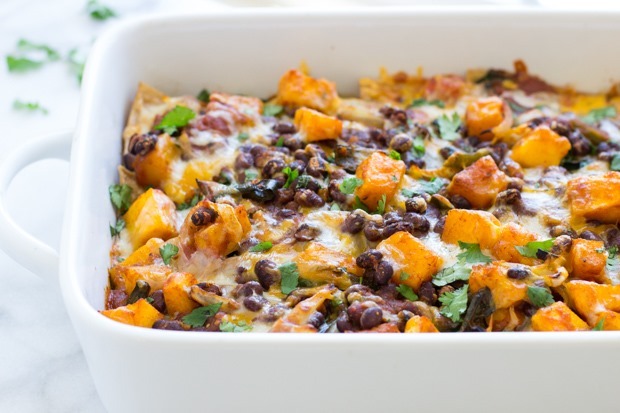 **Make it vegan by omitting the cheese or using dairy-free shredded cheese. Or if you prefer the recipe to be lower in fat, use reduced-fat cheese.